Here are some examples of projects. Carving birds and animals is a real passion for us and has become the hallmark of our company. We work with our clients to produce and high detailed carving that is one of a kind. Architectural carving has a rich and diverse spectrum and it is no surprise that Tim Peek has done a variety of architectural carving commissions. During his career Tim has been able to renovate and produce a client’s taste for interior and exterior design, whether they have a passion for Rococo, Gothic or Baroque, he has been able to recreate any period style with great detail. 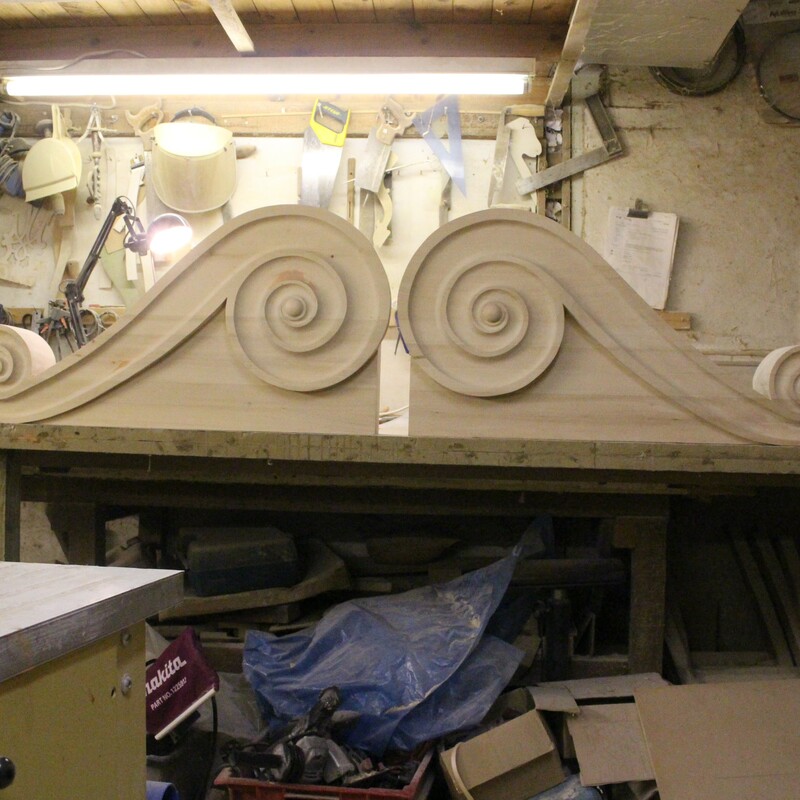 The scope for architectural carving can be limitless, it can range from a rich luxurious portrait surround in a Grinling Gibbons style to elegant carved mouldings, Tim has been able to produce a great range of design to bring life to an ailing room. Ornamental carving is an exciting mix of contemporary and traditional carving, working with interior designs to fully utilise their vision. The mirrors shown on this page have been distressed. This is very popular, but we can also supply as new or with varying degrees of distress. The tables shown on this page can be made to any size to complement the room of your choice. Tim can also tailor your table to the way you want it, whether you want to alter the design such as the table legs, specifically distress the table to a certain standard or simplifying or make the table more ornate to your budget. Tim has always had a strong connection to furniture but none more so than chairs, growing up in High Wycombe, Tim experience first hand the quality of chairmaking coming from the chair capital of the world. All through his career, Tim has worked with several reputable companies in furniture making from Tyzacks, Reed and Rackstraw to Browns of West Wycombe. Whether you want a set of chairs or a one-off of a regency, Chippendale or a Windsor chair ( a famous product from High Wycombe), Tim has the experience and expertise to make the right chair suited to your taste. Our hand carved lettering is the ultimate touch to a personalised piece. Whether it is carving names for president boards for a large company or carving inscription for a personalised a gift, we pride ourselves giving a personal touch to every piece.